There are a couple of photos showing Zapruder leaving the area. He and Stitzman are both at the top of the stairs heading East. Edit: Altgens 8 is the first photo, not sure about the second one. Re: The Patsy Paschall film. Here they are, just having come down from, and moving away from the Pedestal. The Zapruder we see on the Bell Film is Meandering around the area close to the Zapruder Perch. He appears to be doing likewise in Altgens 8. This Contrasts with the High Steppin' gent we see on the Paschall Film above. The conflicting movement of these 2 individuals brings into question the generally accepted time stamping that has been applied to them. To think that the 58 year old Zapruder with his admitted Vertigo condition could leap down from The Perch and then sprint quickly across the Knoll in the fashion we see above defies logic. When considering the time stamping issue of these images, we also need to consider that Sitzman told Tink Thompson when interviewed for his 1966 "Six Seconds In Dallas", that she dismounted The Perch and then Immediately went down the Knoll and spoke with 2 gents she thought were G Men. Shen then said she went back Up the knoll and spoke with a man who Did ID himself as being a G Man. Sitzman telling Thompson less than 3 years after the assassination that she spoke with a G Man After going back UP the knoll needs to be considered when viewing all images of a man in the Zapruder Perch area wearing a suit and hat. If anything defies logic, being in shock does. And i'll tell you right now. I am 63 years old, and that doesn't stop me from running or being very quick in my actions. Stop typecasting Zapruder as an old man. Being in shock after seeing a persons head shot off in front of them would cause anyone to react quickly! 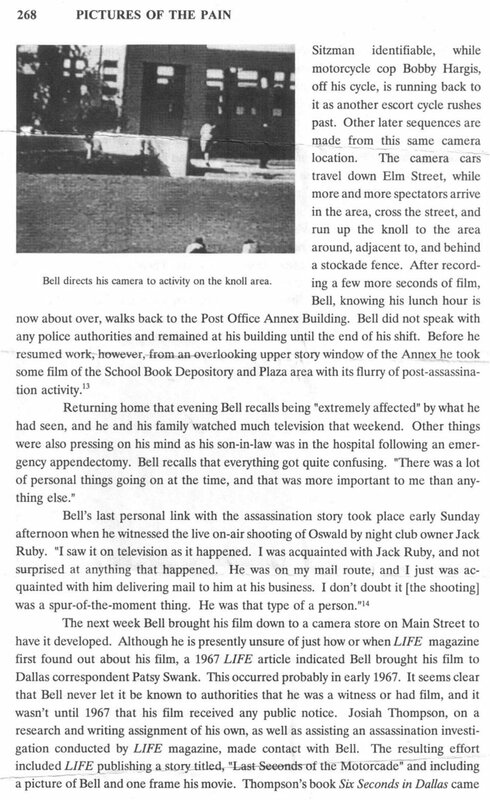 Zapruder does Not "react quickly" as seen on the Bell Film. He is meandering around the Perch area on the Bell Film. This contrasts with the Fast Motion of the individual we are seeing on the Paschall Film. These Contrasting physical actions, both in the Perch area, DQ this as being the same person. The assigned time lines of these films, coupled with Sitzman telling Tink Thompson she spoke with a G Man UP on the knoll, come into play here. The Zapruder we see on the Bell Film is Meandering around the area close to the Zapruder Perch. He appears to be doing likewise in Altgens 8. This Contrasts with the High Steppin' gent we see on the Paschall Film above. Of course the Photographs and Films that you mention contrast with the Paschall clip which I posted above. They show Zapruder's movements at completely different precise locations, and at completely different precise moments in time, all recorded within a very short precise time frame. Are you contending that: (1) Zapruder suffering from Vertigo jumped down off the pedestal unassisted and then Sprinted eastward as we see on the Paschall Film, and (2) then Suddenly threw it into low gear and began meandering around the pedestal area as we see on the Bell Film? If so, you are getting warm. Simply expand the running time Between these 2 films and add 1 to your current cast of characters. The Sitzman version of this same time frame as told to Tink Thompson less than 3 years after the assassination provides a rational explanation for the current Dr Jekyll and Mr Hyde performance being attributed to Zapruder. I'm contending that what you see is what you get, ie, the Historical visually recorded facts showing verifiable time differences between different images captured at different moments in time, which logically accounts for the obvious difference in the movements of Zapruder. It's a no brainer! There is Nothing "logical" as to the movements that have been attributed to a Vertigo suffering, overweight, 58 year old man. Sitzman's narrative checks all the boxes and was her 1st in-depth/detailed interview. The interview was also conducted by a very respected individual. The interview Tink Thompson did with Sitzman was Far more detailed than Anything that was ever done with Zapruder. This would include Zapruder's testimonies.